Anyone else having this issue? I was playing a game and my bluetooth headphones made a beep sound like they were going to die, so I turned them off and switched over to my speakers for sound, but when I turned on the speakers, the game music was not playing in the background. I did a sound test and I could hear the test, but I couldn't get the game audio to come back. I have been trying to update my bluetooth driver, but the latest drivers don't seem to be compatible with my setup for some reason. I uninstalled the latest bluetooth driver update and went back to whichever version that Windows gives me when I do a search for updates automatically online. Everything works fine until I change the output. I'm using a USB Bluetooth dongle, so I'm not sure if that is going bad. I have noticed that the light on the dongle stays on all the time, which I thought that it went off when I turned off my headset. I have disabled exclusive mode in all of my sound devices. This issue was happening in Musicbee whenever I would click out of Musicbee / open Streamlabs OBS, the sound from Musicbee would mute, even though the music was still playing and my OBS was detecting the sound. Hopefully I did an okay job of describing my issue. Check to see if the audio output in the app / game settings u're running is "Primary Sound Driver". If this is the case the app / game should follow your Windows instructions. Put your USB dongle in a safe USB port... don't touch / move / hit it. See that your speakers are powered on. Before Windows was able to switch the output audio device while audio was on, i used (still do) WinAmp with QO Labs AudioBurst FX as the default output plugin... It's a test to see if it's Windows's issue or not. Thread moved from software chat.. I think it's in a safe port. I'm not close enough to the computer to bump it and it was working fine when I first got it. The speakers weren't turned on but when I did turn them on, I couldn't hear the game but I could hear the sound test. Restart your game... the audio should switch then. Too bad MS can't find the right solution for this issue... i too am getting it every once in a while. 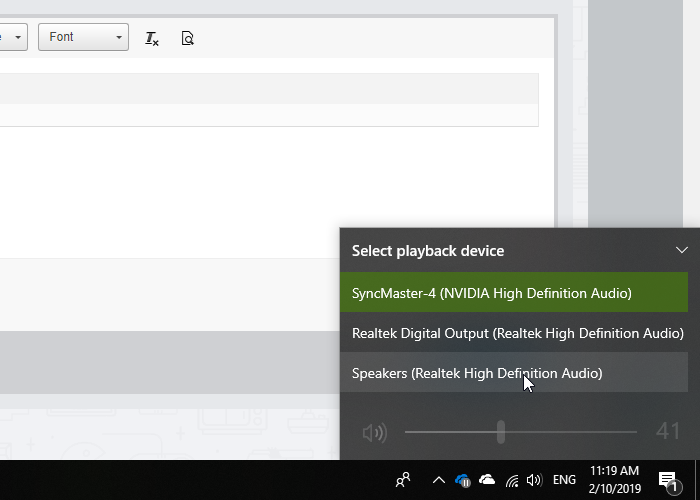 Very kind of you mate but there's no worries i just thought it fitted better here..
i've had a similar issue that the default audio driver switches over to what it thinks is a MS headset, only its an Xbox controller. "Audio Switcher makes switching between sound devices trivial. No longer do you have to go into Control Panel or the Windows® Sound options, instead there is an easy to access icon, or even hotkeys." Restarting the game fixes it, but I'm looking for a more permanent solution so that it doesn't happen at all. Didn't Windows 10 integrate this into the volume icon? yep, they did... but it is not flawless. btw... u are again trying to steer (as u did on another topic a while ago) this... are u a woman? ops problem related to device fallback..